Senior Tory Leavers including David Davis and Jacob Rees-Mogg have backed proposals calling on the Government to seek a “basic” free trade agreement for goods, similar to that struck between the EU and Canada, pointing out that such a move has already been offered by Brussels. But the Prime Minister has outright rejected these proposals, insisting she would rather see Britain exit the bloc without an agreement because the Brexiteers’ vision would result in northern Ireland being broken away. Asked on the flight to New York where she will attend the UN General Assembly, Theresa May was asked by the Daily Express which scenario is better between no-deal and Canada-plus. She said: “I have always said no deal is better than a bad deal. Mrs May’s spokesman later said the Prime Minister was specifically referring to the type of deal the EU is currently offering on future trade, which Britain believes will split England, Wales and Scotland from Northern Ireland, by insisting Northern Ireland follow different customs rules. Her defiant comments come in a week where Tory Brexiteers led by Jacob Rees-Mogg united around the so called Canada plus solution which is also on offer from the EU. Brexiteers believe this will leave Britain freer to make its own trade deals and not have to accept rules from Brussels while eurocrats like the solution because they think it will protect their single market rules. But under its current demands the EU will not accept a Canada plus trade deal which covers Northern Ireland because of complexities with the land border with Ireland. Before her trip to New York Mrs May’s spokesman said the Canada-plus solution would lead to the break-up of the UK because no free trade deal is possible without border checks. Mrs May is still pushing her Brexit compromise plan which includes the UK and EU sharing a common rule book on goods which has been opposed by the Tory Brexiteer European Research Group of MPs. The Prime Minister insisted if her Chequers plan gets through Parliament, it will still allow Britain to have a good trade deal with the US and other countries even if it shares a common rule book on regulations of goods with the EU. Mrs May added: “When we get to the point of a deal – and as Prime Minister I do believe we can get to a good deal – we will take that deal back to Parliament and at that point MPs will have a clear choice. “They will have a choice as to whether to support that deal. 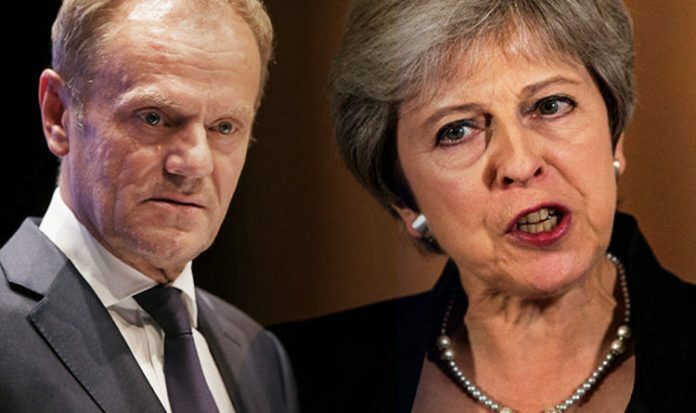 Mrs May also launched a ferocious attack on Labour leader Jeremy Corbyn, warning he will oppose any deal she brings back from Brussels and accept any proposal put forward by the EU. Speaking at Labour’s annual conference in Liverpool on Tuesday, Brexit spokesman Sir Keir Starmer told MPs the party would vote against any deal the Prime Minister returns with that does not meet its six ‘tests’, including delivering “the exact same benefits” as single market and customs union membership. But Mrs May raged: “Labour will oppose any deal I bring back regardless of how good it is for the UK.